The first trophy day of the year was our Annual Icicle Trophy event on 7 January. The day was a cold and somewhat breezy one resulting in a smaller number of entries than usual. With Simon Derham managing to clinch the title by winning the first 2 races in his Solo, it was only the hardiest that made it through to the very end of the day. The Brass Monkey Trophy followed closely on 4 February. Again a chilly day reminding us of where the name name of the event originated, but this time with a little less wind, so attracting a good turnout. 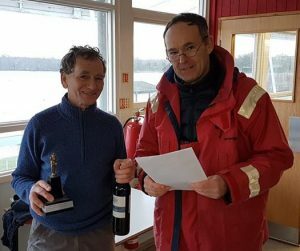 The leaders on the water enjoyed a day of close nip and tuck racing, though it was Malcolm Underwood in his Pico Sport following round who pipped everyone to the post on handicap in all 3 races. 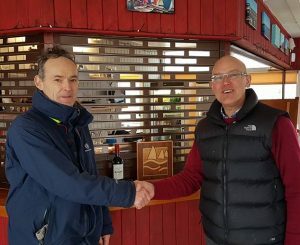 The Burgee Trophy, competed over two sailing days on consecutive weekends, a mini series of 10 General Handicap races in our popular ‘Short Race’ format, took place on the 25 February and 4 March. The first of the two days was bitterly cold with a raw wind blowing. Those who braved the conditions did well if they managed to sail all five races of that day. 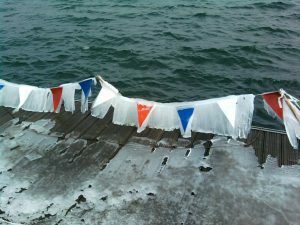 It was this week between the two event days that saw the ‘Beast from the East’ arrive and although we certainly didn’t suffer as much as some other areas of the country, there was considerable doubt as to whether the second of the two days would be able to go ahead. Thankfully the day before temperatures rose melting most of the snow and ice just in time for Sunday and the event was able to be completed. After a day of fierce competition it was Julian Rickards, sailing his Solo, who sailed consistently to claim the trophy as his. Over the two days of racing a total of 17 competitors participated.